will there be centipedes, trapdoor spiders and millipedes? Who is this being hosted by? Is there any show going to happen in Pretoria? amateur, each exhibitor is responsible for what they bring for sale. I have never seen what you have mentioned at any of the expo's, so I don't think they will be available, but I am speaking under correction. Ales, Bushviper and myself arrange this one as well. tobiasf, we are still looking for a permanent home for this expo, we would like to move it to Pretoria, but have not found a suitable venue yet. Are there ever any expos in Cape Town? tobias, I have tried them. They don't seem to be keen on reptiles. I will try them again. 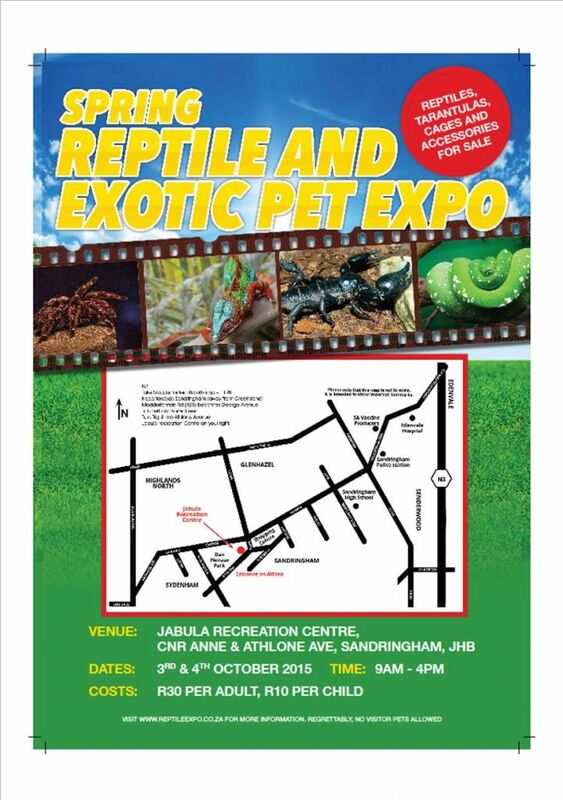 will the expo be still at the jabula recreation centre then? At this stage, yes. Most definitly for this years expo, and possibly next year as well. Plan for the 7th & 8th May 2016. 1. Only official exhibitors are permitted to sell at the expo. 2. All animals must be kept in secure containers. 3. No pets allowed to be brought into the exhibition hall. 4. All rights reserved. The organizers, venue staff and management shall not be held responsible or liable for any damage, loss of property or injury of any nature, or death suffered by any person entering these premises or the use of any facilities offered, whether caused as a result of negligence of the management, staff or vendors due to any cause whatsoever. 6. Handling any animals is done so at own risk. The organizers, the venue staff and management shall not be held responsible and disclaims all liability for injury or damage, whether direct or consequential, while visiting the facilities. 7. In case of emergency, contact 083 374 7087 or 0837399303.